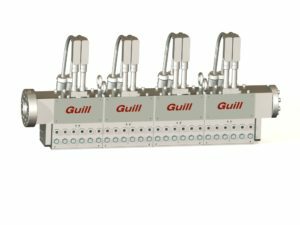 100 - Pelletizing Heads | Guill Tool & Engineering Co. Inc. Whether you are looking Single or Multi-Strand configurations with or without Multi-Layer capabilities, we are able to provide a solution for your project. 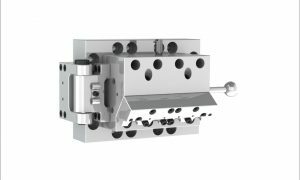 If require more than one of our standard In-line heads, our team of engineers are available to custom design an extrusion head to meet your requirements. By using Computational Fluid Dynamics (CFD) design programs, we can balance the melt flow for the multi-strand applications. Multi-layer strands assure exact material quantities for each pellet. Our tooling is capable of muliple-layers with single or multiple strands. Interchangeable die plates or custom die plates for food processing are available.